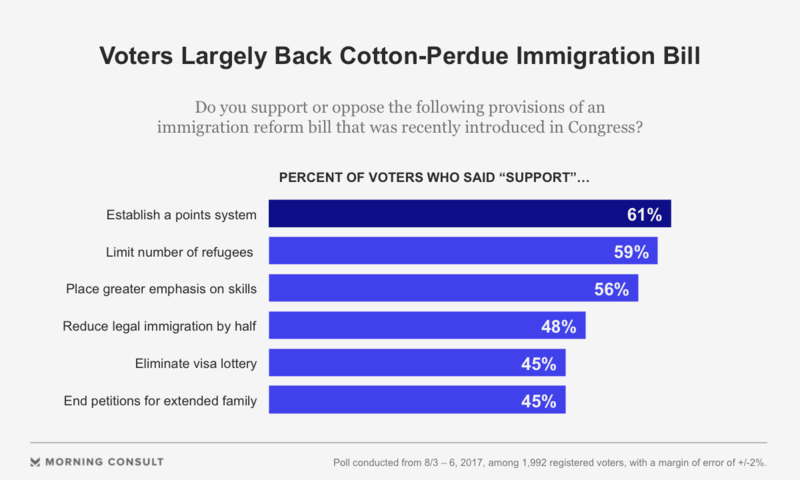 A plan to reduce legal immigration to the U.S. backed by President Donald Trump was met by a decent first impression from voters, according to a new Morning Consult/POLITICO poll. The survey found 44 percent of voters said they supported the plan introduced last week by Republican Sens. Tom Cotton (Ark.) and David Perdue (Ga.) after they were informed about various components of the immigration bill. Three in 10 voters said they oppose it, the survey found. The goal of the plan is to reduce the number of low-skilled immigrants and establish a points system to favor green card applicants who “can speak English, financially support themselves and their families, and demonstrate skills that will contribute to our economy,” Trump said. Overall, about a quarter of voters (24 percent) said they did not know or had no opinion, which could be a large enough chunk of voters that could tip the scales against the bill’s supporters if voters were offered more information. The bill’s most popular provision was the points system. Six in 10 (61 percent) support an immigration program that “would award points based on criteria such as education, English-language ability, and prospective salary.” That was followed by support by 59 percent of voters for limiting the number of refugees the U.S. offers permanent residency. Among six provisions of the Republican plan that were tested, the least popular idea was one to reduce the number of legal immigrants allowed into the U.S. by half over the next decade. Just under 4 in 10 voters (39 percent) opposed the idea, while 48 percent support it. According to the poll, Democrats oppose the plan, 49 percent to 28 percent, while 7 in 10 Republicans support it. Just 11 percent of Republicans opposed it, as described. On Capitol Hill, the measure has earned the ire of Democrats. “Whether unleashing a deportation force to tear apart families, or threatening the protections of DACA, or backing the tired cruelty of this bill, the Trump Administration continues to choose discrimination over smart policies that strengthen and enrich our nation,” said House Democratic Leader Nancy Pelosi (D-Calif.), in a statement last week. A plurality of Americans (42 percent) think there are too many low-skilled immigrants in the U.S., including 56 percent of Republicans. Democrats did not say they wanted more (only 16 percent said there were “too few” low skilled workers), but they were split, 30 percent to 31 percent, between saying there are too many and about the right amount. A smaller plurality of overall voters (36 percent) said there are too few high skilled workers, including pluralities of both Republicans (33 percent) and Democrats (39 percent). Nearly 4 in 10 Americans (39 percent) said there were about the right amount, while just 12 percent said there were too few. Asked if there were too many or too few legal immigrants in the U.S. overall, a group Trump and some other Republicans have said they want to reduce, more than 3 in 10 (32 percent) said there were too many. Half of Republican voters said there are too many legal immigrants in the U.S., compared with 23 percent of Democrats who said the same. Six in 10 Americans said family ties should be a factor when determining who is allowed to immigrate to the U.S., and just slightly more — 62 percent — said the ability to speak English should be considered. Roughly the same amount (63 percent) said age should not be considered when making a determination. The survey also found immigrants with family ties would lose out, just slightly, when pitted against immigrants with job skills, 36 percent to 39 percent. This question resulted in a strong partisan split: 46 percent of Democrats said family ties should have a greater emphasis, while 46 percent of Republicans said a prospective immigrant’s job skills were most important. The survey of 1,992 registered voters was conducted Aug. 3-6 and has a margin of error of plus or minus 2 percentage points. View the crosstabs here.